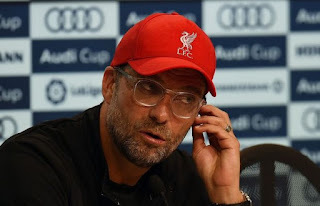 Liverpool manager, Jurgen Klopp has named the club that can stop Pep Guardiola’s Manchester City from retaining the Premier League title this season. Guardiola’s men won the English topflight league title last campaign with a record 100 points from 38 games. According to Klopp, only “City can stop City” from retaining the Premier League title this term. Speaking to reporters on Tuesday, Klopp was quoted by France 24 as saying: “Only City can stop City from wining the Premier League, to be honest. Klopp added: “I would say we are always motivated at the highest level so where could we put this extra portion, saying if City lost then it makes us more motivated? That doesn’t work. We are really concentrating on our situation. Klopp’s men are currently on top of the Premier League table with 45 points from 17 games, while City are second place with 44 points from the same number of games.